The most successful club in England, we made this infographic on the timeline of the honours they’ve won since the birth of the club. 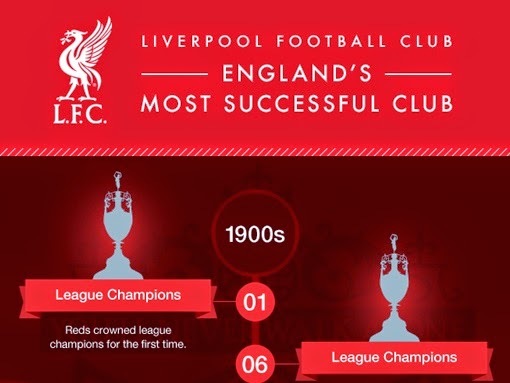 Liverpool, the most successful club in England, we made this infographic on the timeline of the honours they’ve won since the birth of the club. Beginning in 1901, when Liverpool one their first league title, the infographic takes you through the ‘golden age’ of Liverpool Football Club in the 1980’s through to now, where their latest achievement is the League cup in 2012. The Reds hold a vast amount of honours, including league titles however since the league became the Premier League they haven’t secured one. After a strong attack for the title last reason everyone wondered if Liverpool could be returning to this golden age, despite a slump in form from last season they still are proving themselves as contenders for top 4 and could look to add to their trophy candidate soon. Liverpool have won total of 41 trophies, including 18 League titles, 5 Champions League trophies (more than any other English side), 7 FA Cups, 8 League Cups and 3 Europa League titles. See the full infographic on the timeline of the Merseyside club. For more details visit the official website of Liverpool.